Protocol: The first part of a web address, http://, is the HyperText Transfer Protocol (HTTP), which identifies the protocol that allows a computer to browse the web by getting information from a remote server. Secure access to the Internet (that is, anytime a domain has an SSL [Secure Sockets Layer] certificate installed on the host server for encrypting private data) requires the use of the https:// (note the s for secure) protocol. www: The second part refers to the World Wide web and identifies the type of page that will be delivered in a browser window. Another type of web address includes domains where the www. is omitted, such as in maps.google.com. This type of address refers to a subsite or subdomain that resides on the main domain’s servers but is separate from it. Domain name: The third part identifies the unique name of the website as registered by the owner of the site. Domain names may contain any combination of uppercase and lowercase letters and numbers. In addition, though less often used, domain names may also include hyphens but no other special characters, as in www.jet-streamshowerhead.net. Extension: The fourth part identifies the type of site visitors should expect to see at the address, such as .com for commercial business sites, .org for nonprofit organizations, and .edu for educational sites. 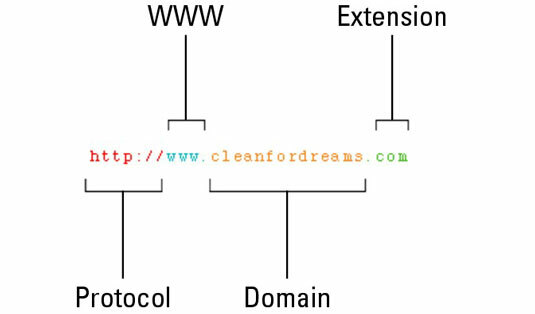 Although several unrestricted top level domain (TDL) extensions are in use by all kinds of businesses around the world, the most familiar extensions should really be used as they were intended. For example, the .org extension should be used for nonprofit organizations, and the .gov extension should be used exclusively for government agencies. There are other common extensions around the world. For a complete listing and description of all the domain name extensions available to you and your clients, visit Network Solutions. In addition, ICANN (Internet Corporation for Assigned Names and Numbers) is currently developing several new extensions slated for public use sometime in 2013. Many of the new extensions are industry related as well as geo/cultural, such as .law, .futbol, and .solar. You can view a complete listing at New gTLDs.